From slave times to the present the proverb has been a mainstay in African-American communication. Such sayings as "Hard times make a monkey eat red pepper when he don't care for black," "The blacker the berry, the sweeter the juice," and "Nothing ruins a duck but its bill" convey not only axiomatic impact but also profound contextual meanings. This study of African-American proverbs is the first to probe deeply into these meanings and contexts. Sw. Anand Prahlad's interest in proverbs dates back to his own childhood in rural Virginia when he listened to his great grandmother's stories. Very early he began collecting "sayings," and, in researching this book, he spent five years listening to proverbs spoken in bars, clubs, churches, and retirement homes; on street corners, basketball courts, and public buses; at PTA meetings and bingo games. To discover the full context of a proverb, Prahlad considers four levels of meanings--grammatical, cultural, situational, and symbolic. The grammatical level refers to its literal meanings, the cultural level to its associations shared by most members of the cultural group, the situational level to the specific situation in which the proverb is spoken, and the symbolic to the speaker's own personal associations with the proverb. All these operate simultaneously when a proverb is spoken. Since the speaker may be fully aware of all levels, part of the artistry in using proverbs comes from the complex interplay of the dimensions of their meanings. 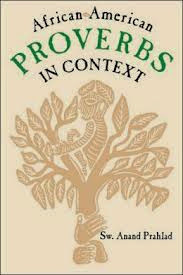 African-American Proverbs in Context documents and analyzes both historic and contemporary proverbs. A survey of WPA interviews with former slaves and of the lyrics of blues songs and the contexts in which these were performed shows how proverbs have been used as a means of protest and cultural affirmation. Extensive field research conducted by the author with both master proverb users and young persons reveals the myriad functions proverbs perform in modern America. These range from direct communication of traditional knowledge to aggressive verbal competition among youths wishing to establish identity and status.